The four-diamond Omni Royal Orleans is located in the heart of the French Quarter just moments from the excitement of Bourbon Street and picturesque Jackson Square as well as the galleries and antique stores of Royal Street. This luxury hotel offers a retreat from the excitement of the city with its artful collection of 19th-century antiques and Creole charm. Our elegant 345 rooms and suites offer plush comfort as well as the latest in technology including high-speed wireless internet access that is complimentary for our Omni Select Guest program members. The Omni Royal Orleans also stands out for its restaurant the Rib Room a Zagat award winner and more than fifty years a landmark dining destination in a city known for its exceptional cuisine. Guests can also enjoy cocktails and a light meal at the rooftop La Riviera Bar and Grill or at the Touche Bar. The Omni Royal Orleans offers a state-of-the-art fitness facility as well as a rooftop observation deck and year-round heated swimming pool. The hotel is just 12 miles from Louis Armstrong International Airport and just nine blocks from the New Orleans cruise ship terminal. The hotel is 100 percent non-smoking. 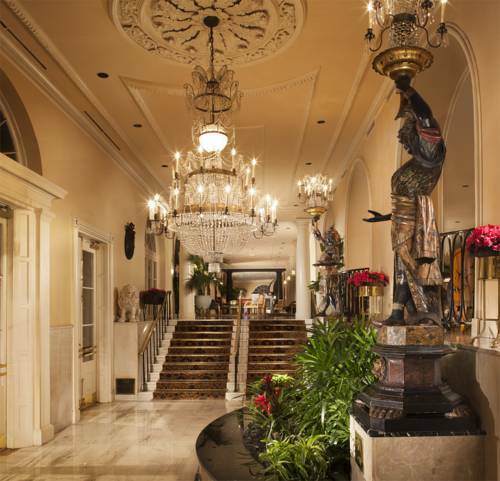 The Omni Royal Orleans, where four-diamond luxurious comfort embraces style. Rib Room: Winner of the prestigious Zagat Award the Rib Room serves prime rib and other beef specialties plus fowl and seafood prepared on giant French rotisseries and mesquite grills. Open daily 630-1030 for breakfast, 1130-1400 for lunch, 1800-2100 Sun-Thu and 1800-2200 Fri-Sat for dinner, Sun 1130-1430 for brunch. Rib Room Bar: The Rib Room Bar has become famous as the home of the Washbucket Martini and is a favorite with local antique dealers and celebrities as well as politicians and tourists alike. Open daily 1130-2400. Touche Bar: With its entrance just off Royal Street which has many antique stores and galleries, the Touche Bar has been serving locals and tourists in a relaxed setting. The best Mint Juleps in New Orleans are served here plus light meals including salads sandwiches and light entrees. Open daily 1100-Midnight. La Riviera Poolside Service Seasonal: This delightful poolside oasis is open daily from April through October 1130-2000 hours and offers a light menu and features its famous frozen daiquiris. La Riviera offers a spectacular view of the city and the Mississippi River. Voted Best view in Louisiana by Travel-Leisure. Located on of St. Louis Street between Chartres and Royal the Omni Royal Orleans lies in the heart of the vibrant French Quarter. The hotel is one block from Bourbon Street and other must-see attractions including the many art galleries and antique shops of Royal Street as well as the casinos and the Riverfront. The hotel is just nine blocks from the New Orleans cruise ship terminal and is only 12 miles from Louis Armstrong Airport. New Orleans City CenterHotel is in City Center.